Rail bosses have told campaigners they can’t keep a promise to reopen a mothballed East Lothian station next year – because there aren’t enough trains in Scotland. Campaigners say they are “very concerned” after being told by ScotRail that the planned reopening of East Linton station will be delayed by up to two years. 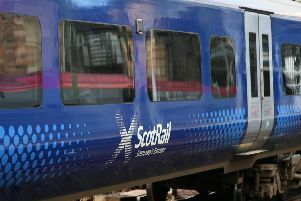 After a long campaign by the Rail Action Group East of Scotland (Rages), returning rail services to East Linton and Reston in the Borders was written into the contract for new ScotRail franchise holder Abellio, which took over the railways in April. The commitment was underlined in November last year, with Scottish Government minister Paul Wheelhouse saying the service could begin as early as December 2016. However, campaigners have now been told there won’t be enough trains to serve East Linton – which sits on the East Coast Main Line between Dunbar and Drem – until 2018. Rages spokesman Russell Darling said: “Abellio told us the news recently – we’ve been in touch with the minister for transport to try and sort it out. “They are quite tight for rolling stock in Scotland, but we thought they might be able to bring something in from elsewhere in Britain. “The minister has said that the reopening is to go ahead, and it’s in Abellio’s franchise. Local MSP Iain Gray, who has taken part in discussions with the government alongside rail campaigners, said the news was a “major disappointment”. He said: “Getting a proper local service to Dunbar, with a new station at East Linton into the ScotRail franchise, was a massive victory for Rages campaigners. Both stations were boarded up in the 1960s during sweeping cuts to the UK’s rail network. Campaigners have sought support from an investment fund set up by the Scottish Government to restore and improve train stations and bring East Linton back to life. Design work necessary to reopen the station has been estimated to cost £400,000.